Close Support Weapon features don't work on Arma 2 standalone. Demonized AI flare scripts don't support OA weapons yet. OA only users will need to turn off AI Flares in the user-config. All Round Defense (ARD) is a formation typically used by the British Army (and other fighting forces) after a firefight to 're-org' the squad, making sure everyone has ammunition and tending any wounds. As per it's name, it can also be used defensively, providing 360 degree coverage. There are a number of features included to make commanding AI to perform specific tasks easier. This frees up the players time and they can focus on other matters at hand. Up to 20 units can be ordered into ARD. When activated, the scripts will count the amount of AI units eligible and order them into a circle around the players current position, with equidistant spacing between them. 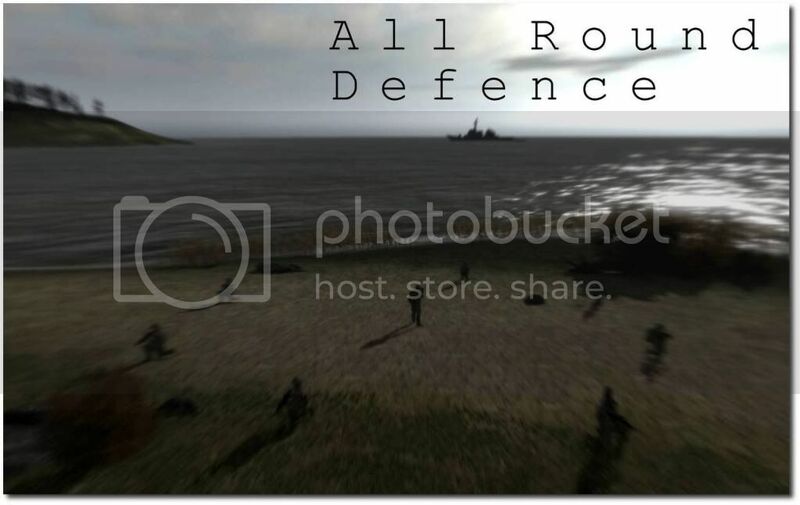 The radius of the circle is determined by pre-sets from the ARD Menu (10 meters up to 50 meters), or the player can point his weapon at the terrain and press a user-defined hotkey to order the men into anything up to a 100 meter radius (does not need to open the menu). You can make your squad form back up by pressing the 'Form On Me' button in the ARD menu. Also, if you move outside of the radius, your men will automatically form on you. If you want to move out of the radius and keep your squad in ARD, then press the 'Hold' button in the ARD menu. Your squad can also be set as prone or crouched (default) by pressing the respective 'Prone' and 'Crouch' buttons in the ARD menu. You must be stationary to open the ARD menu or use the hot-key. If you are in a vehicle, it must be stationary. If you are piloting a chopper, you can issue the order if it is hovering (auto-hover helps). If your units are in a vehicle, they will dismount (even the commander and driver). The player will not automatically dismount though. Units manning static weapons or assigned as the gunner in a vehicle will scan the horizon for threats and stay embarked. Medics will not form up into ARD (as they are needed for other tasks instead of perimeter defense). If your squad is in a chopper, they will only dismount if you are less than 2 meters off the ground, or if you are over 50 meters from the ground they will parachute in. Anything in between and they refuse, for fear of dying/injury. If you issued the order to form up from a chopper hovering over 50 meters up, your men will go into 'Hold' mode and will wait for you to manually order them back into formation (with either the default BIS commands or 'Form On Me' from the ARD menu). Due to improvements with AI path finding in recent betas, the script can now be activated when in "Combat"/"Danger" mode. When your squad is in ARD, CSW's can be deployed accurately (4 meters in front of player and facing in the players direction) by clicking 'CSW Deploy' and also any CSW within 50 meters can be retrieved by clicking once on the menu - 'CSW Breakdown'. If you have a squad medic, you can order them to heal all wounded units - click on 'Medic'. A maximum of 8 units can be healed at any one time. The Medic will not perform this action if the squad is in combat mode. If a unit is the gunner in a vehicle and the vehicle has smoke launchers, they will deploy smoke if the vehicle is damaged or if one of your squad is killed (giving you time to respond to threats). This feature can be disabled from the user-config if not wanted. Your men will also throw a smoke grenade if they are wounded. They must have at least one smoke grenade in their inventory for this to work. The men will not throw a smoke grenade if it is night. The probability of throwing a smoke grenade can be defined in the user-config. This feature can also be disabled from the user-config if desired. A modified version Demonized's brilliant 'AI Shoot Flare' scripts are included in ARD. If it is night, any AI unit under your control with an under barrel grenade launcher will fire a flare into the air to illuminate your enemies. ARD also includes the excellent ECHO artillery scripts. If there are artillery pieces available, order your men into them and then press 'Artillery Start'. They will leave the player group and wait for target information to be passed to them. Any units left in your group become spotters and will automatically relay target information to the artillery squad. Fire orders will be issued automatically against any viable targets. Your AI men spot up to 600 meters. The player spotting distance is user definable in the user-config (Default is 1500 meters). Other options in the user-config can be changed such as the time between fire missions, and dispersion of rounds. When you want to stop the artillery firing autonomously, press the "Artillery Stop" button in the ARD menu. They will then finish any fire missions they are on, then re-join your group. This has been coded so that it is compatible with R3F Artillery (if installed). You cannot use both at once, but there should be no clashes between them. R3F may put a warning about Arty modules on the screen. You can safely ignore it. A maximum of three units can be used for the Artillery Support.